The black Cat Track brutality in the Morobe province received widespread criticism, and some of the blame has been levelled against PNG’s Tourism Industry. The Eastern Highlands Governor says the PNG's tourism industry isn’t effective. And with the country’s law and order situation has not improved. “The Tourism office is ineffective. There is not enough manpower. It needs to be strengthen”, said Governor Soso. Eastern Highlands Province relies a lot on tourism as an earner for the province. She said most provincial tourism boards are defunct and some provinces don’t own resource projects and rely on tourism as their income earner`. She also expressed her disappointment over the level of treatment towards more than twenty international tourists when they came to the 57th Goroka show last weekend. “Tourists who have arranged two years ago to come to the Goroka show were left strandard at Port Moresby’s International Airport. Services given to international tourists in terms of travel arrangements should be satisfactory. Let’s not disappoint them”, Governor Soso Said. The attack on the eight foreign tourists to a large extent might have tainted Papua New Guinea’s tourism industry. But the Eastern Highlands governor says, PNG still has huge potential in the tourism industry that needs to be developed. 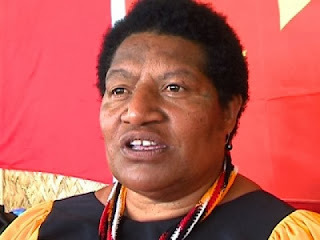 She says despite the black cat track incident in the Morobe province, Eastern Highlands Province will continue to maintain tourism as the main revenue driver for the province, and she called on the PNG tourism to make improvements.